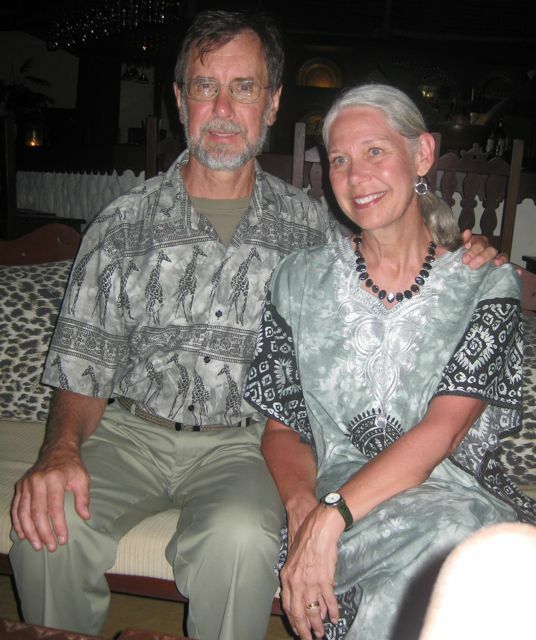 We are very grateful for all the individuals and churches that support our work and ministry here in Kenya. We are also thankful for the many companies that have responded for requests for equipment, instruments, disposables, etc. One company in particular that has helped us out tremendously is Synthes (www.synthes.com). They develop, produce and market instruments, implants and biomaterials for the surgical fixation, correction and regeneration of the skeleton and its soft tissues. 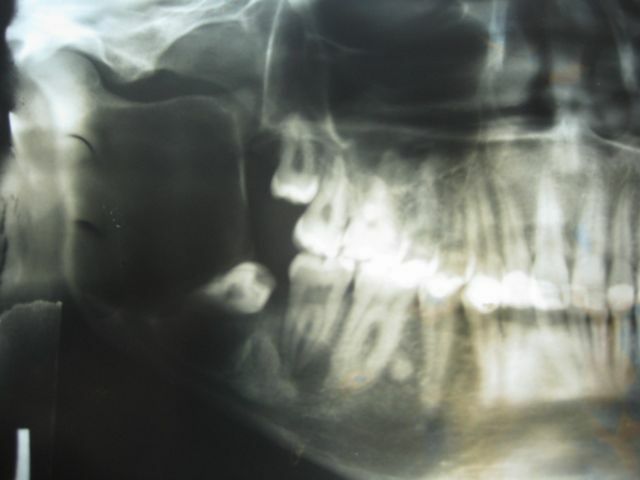 We use there products to fixate unfavorable jaw fractures. With help from Samaritan's Purse for logistics (Scott & Mary Elizabeth) Synthes (Paul Gordon) donated two complete fracture kits of 2.0 and 2.4 mm plates and screws. This company has no direct connection or financial gain in this donation, just the desire to help out in the developing world. 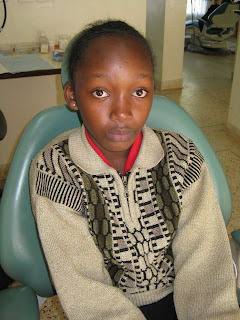 We thank Synthes for their donation; and I think this Kenyan patient thanks you even more. Take Your Kids to Work Day. 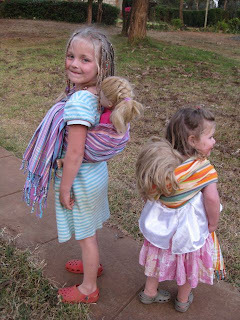 I don't think take your kids to work day exists here in Kenya (work is often too far for the kids to walk), but we decided it was time to bring this tradition to our home. 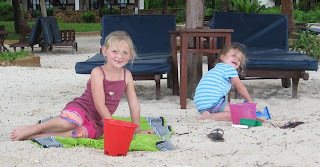 Plus our kids and their (Nancy & Sarah's) kids were all on holiday. 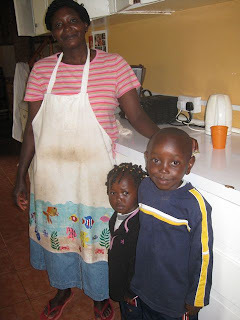 After Matatu service was arranged Sarah and Nancy (our helpers) took their kids to work (our house)! It is interesting to me that they have house-helpers in their homes as well. Nancy has 3 daughters (Martha, Ana, & Joy). Sarah has a son (John) and dauther (faith). John and Faith decided they wanted pepperoni pizza for lunch. 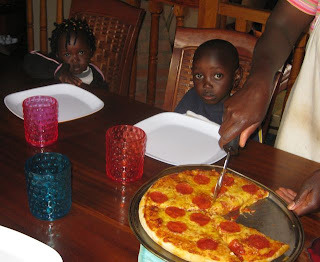 It turns out they were not to keen on the mozarella cheese, but loved the pepperoni. Meredith, Amelia, Ana, Joy, & Martha making necklaces with the always popular POP-beads. Indeed I see more different things in a month in Africa than perhaps a career as a GD back home. Take a look. First Patient) 5 years previous 9 YOBM was in RTA. 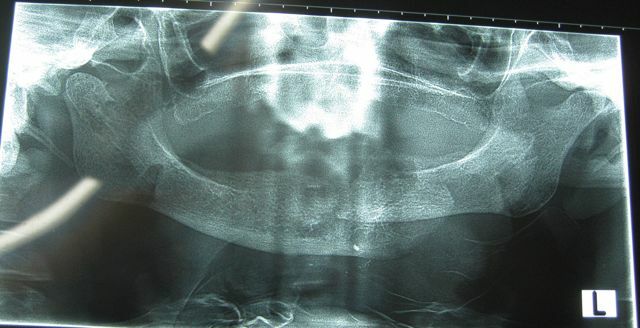 Experienced broken mandible at angle (L side) and was treated with ORIF. Never returned year later to have ORIF removed. Came to our clinic today (at age 14) complaining of... and with visible localized swelling in parasymphaseal (L side). Palpation is firm, no pain. Closer look on x-ray shows tooth # 20 failed to erupt caught at inferior border of mandible superimposed by ORIF. Second Patient) 70 YOF. No Pain. 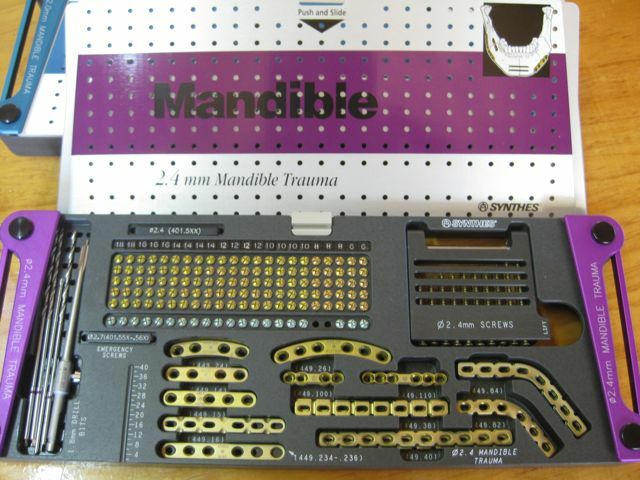 Edentulous. Motor Vehicle accident 1 month previous. The fracture (L side) is one month old. Malunion has occurred. No mobility of the mandibular fragments, swelling, or puss. Patient has surprisingly normal ROM. Fracture and badly displaced segments. 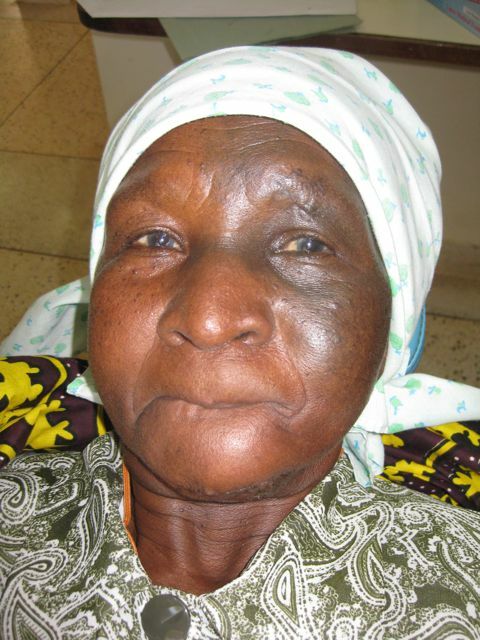 Patient declines surgery and wants new denture fabricated. 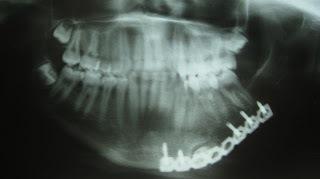 Third Patient) 63 YOBF 1 year after full mouth edentulation. Chronic intraoral draining fistula and necrotic mandible exposed on R side. 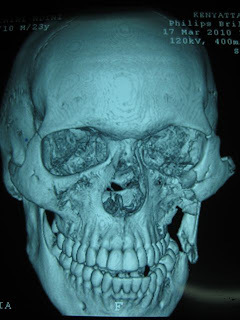 All indications point to osteomyelitis of the mandible. Fourth Patient) Determining if patient can touch his shoulders together (He can not). No sign of Bifid ribs or Basal Cell Nevus Syndrome. Notice very little extra-oral swelling. Two years previous 17 and 32 were extracted and biopsy was taken. The biopsy was positive for Odontogenic Keratocyst (OKC). You can see how this cyst has extended from body of mandible up into ramus and well within coronoid and condyle. Little if any intra-oral swelling is seen. This is Sarah our house-helper and her two children John (6) and Faith (2). 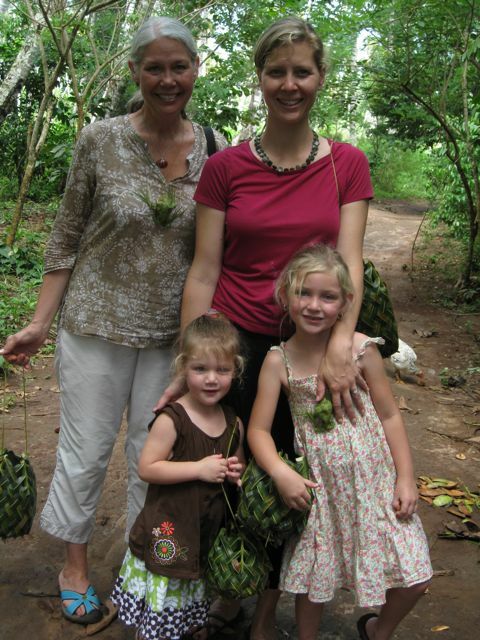 Sarah has worked hard for many years with various missionary families to become an outstanding cook. 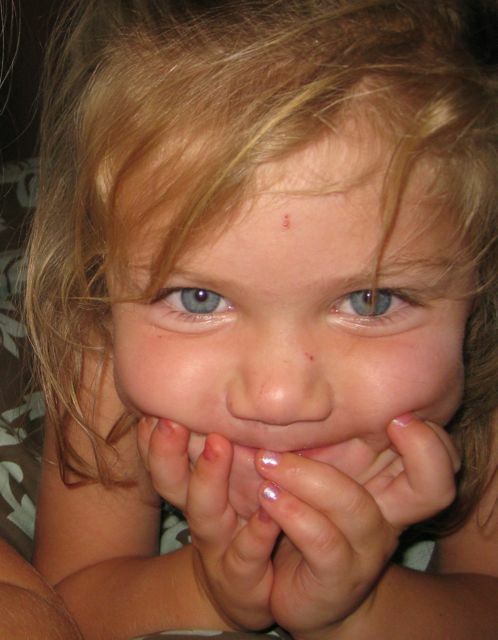 I'm not sure how we became fortunate to have her with our family 3 days per week. She cooks delicious pizza, chicken curry, enchiladas, and potato soup with a joyful spirit. 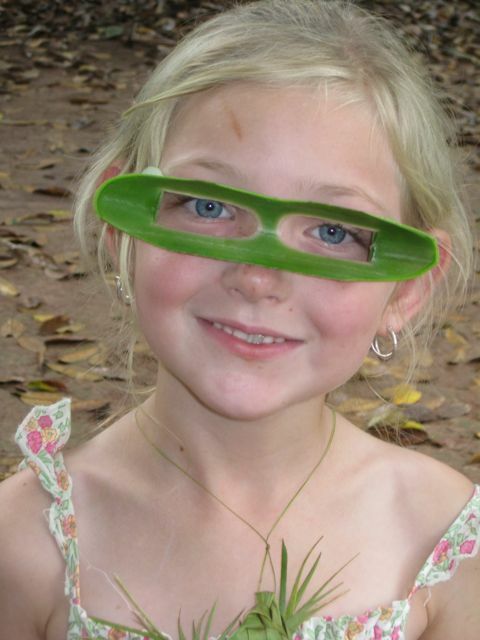 Around Christmas time we asked Sarah if there was anything that would help out her family that would be sustainable. She indicated that she had always wanted electricity for her house but it was always too expensive to have the electric wire run to the house, the meter installed, and the house wired. The total cost was about 28,00 KSH (400 USD). But the month to month cost of paying her electric bill she could manage as it would be offset by the Kerosene for her lamp that she would not have to buy. Sarah made the written application. She hired an electrician to wire her house. Her application to Kenyan Power was accepted after a few months. Thanks to your generous donations into our project account Sarah was able to pay the fee to Kenyan Power for electricity! She now has working electricity in her house for the first time. I asked Sarah what was her favorite thing about having electricity. She said, "you know now we can spend more time outside in the garden while it is light, but I can cook dinner for our family at 8:00 PM (normal dinner time in Kenya) and see what I am doing. And also Jonathan doesn't have to remain after school, because now he can do his homework at home in the evenings under our light." We are pleased for your support, thank God for electricity. Before I was using candles and kerosene, of which would give little light. But now no more darkness! We can easily prepare food and the kids can do studies without problems. Thanks for a helping hand. You are great and to be blessed. This is the scene of our ER Friday morning. 20 injured people brought into Kijabe because a bus and lorry collided as the bus tried to overtake the lorry. I was called because 1 woman was pregnant. Malin was called because of the multiple jaw fractures. The pregnant woman also had an open book pelvic fracture-- and when I saw that on her x-ray rushed to get someone from Ortho help me sheet her pelvic. 8 people died at the scene. An 8 month old arrived having lost his mom at the accident. As awful as the scene was, it was amazing what our hospital could actually do and did. While we don't have emergency drills, we do have an emergency high casualty plan and for the most part it worked. People got their X-rays, C-spines cleared, IVs, and those who needed to be were intubated and taken immediately for surgery. That being said, driving here will always be one of the most stressful things we do. I can't even describe the general chaos on the road, nor the recklessness people have when passing and let me just add they pass ALL the time. How we sincerely pray for God's protection as we travel! "Mommy, I want to wear the dress Claire gave me,"
"No Meredith, your dress is fine. Do you want a snack before your nap?" "Yes Mommy, can I have cereal?" Bowl of cereal poured. Mommy goes upstairs to get something. Comes down to find Meredith, the table and floor, covered in cereal, and Meredith crying, "I need a new dress; this is wet." "Meredith did you do this on purpose?" "Yes Mommy, I sorry, but I need to wear Claire's dress," she says through the tears. Well, now Claire's dress and cereal are not part of Meredith's life for 3 days. Grief comes to each of us at some time in our lives. There’s an inherent unfairness in grief... unfair in who and how it’s dispersed out. You can always find someone who’s circumstances trump your own: someone with more miscarriages, someone with more death in their family, someone who’s circumstances seem greater to bear, but that certainly doesn’t provide comfort and perhaps even brings guilt. It’s hard to be present with someone grieving. Who really just wants to weep with someone? Isn’t easier to give advice about why this happened, quote Bible verses, offer spiritual idioms, try to provide a cheerful spin, or share personal experiences? And yet the grieving need comfort and assurance. So how do I provide that as one grieving ministering to many others grieving? In Kate Brasestrup’s book “Here if you need me,” she writes about the ministry of presence. The ministry of “just showing-up.” While it sounds easy, I think for most of us it turns out to be a hard discipline. We read of Jesus doing this when he learns of the death of his friend, “Jesus wept.” We don’t read of Christ saying, “All things work together for the good of those who love Him" or “You’ll see him in heaven” or “I’ve arrived; don’t worry. ” And the miracle of the resurrection only comes after Christ presently ministered with tears to the family grieving. Being present, being willing to stay in the grief until it has passed is not wallowing, weak, or wasteful, it is healing. Thankfully, we worship a God who cares about our future (good books often help). 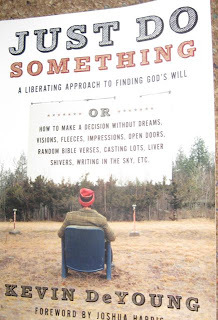 DeYoung in his book ‘Do Something’ tells us I know exactly what God’s will for your life is. And it is found in 1 Thessalonians 4:3. Bang! Taaa-daaaa! Cha-ching! There it is... in one sentence. God’s will for your/my life is to be sanctified (to live differently, set apart for Him.) A little bit of an underwhelming answer at first? Let’s look a little deeper at what this means. 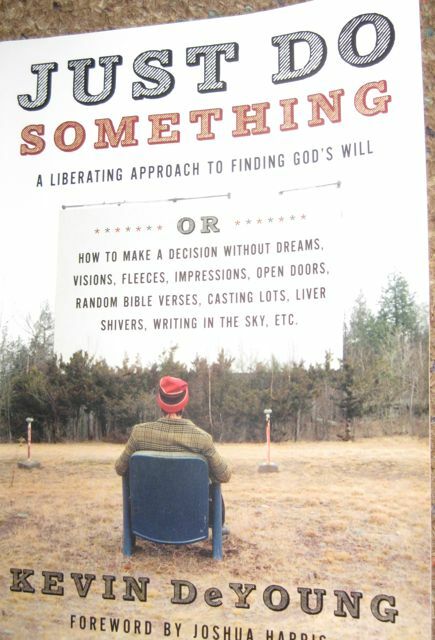 I would like to share five concepts from this book about God's will that have been helpful. 1) Just talking about the “will of God” can be a confusing thing. Are we suppose to find the “will of God”? Shouldn’t we already be doing the “will of God” each day? Doesn’t everything happen according to “God’s will” anyway? c) There is a third side..but it is ours, not God’s. It it the “will of direction.” It’s what we think of when we ask all those questions in the previous paragraph...God when, God who, God how many? The Bible clearly tells us God has a plan for our life, but special revelation is rare. God doesn’t always (and sometimes rarely) answers our questions that have to do with the ‘will of direction’. 3) We can be obsessed with finding God’s will to the point that we become paralyzed to make a decision. First, we have an abundance of choices majors, careers, churches, restaurants, hobbies, etc....much more so than a previous generations. Second, rather than “reveling in the freedom, we find it agonizing.” Third, any decision we make (picking a major, buying a house, joining a church) cuts off options D, E and F (the other major, condo, or church). 4) God’s will is not like a Bull’s eye where we stand at the range, draw our bow, and fire. Anything less than dead middle is out of the center of God’s will. This sets us up for a false mindset. If we strike the bull’s eye we are destined to be blessed and happy. If we miss we are destined for failure, guilt, and hopelessness. Every decision from your chosen major to if you should buy a boat is racked with fear. 5) God cares more about the how (moral decisions), rather than the where, when and who (non-moral decisions). We tend to care much more about the non-moral decisions (should I go for further education or start my own business) than the moral decisions (am I being a faithful member of my church). Although which town you choose to live is important to God, He care’s more about whether you are running hard after him in that town. Although God is concerned with your career choice, He is most pleased when you are glorifying him in what you do at work through your honesty, excellence, and fairness with others. God certainly cares about who you marry, but He cares most about if you honoring Him by the way you love your husband or wife. Many of the concepts ring true to us (maybe you as well) when we are trying to figure out God’s will for 2011. God’s will can be confusing. At this time we feel we are doing God’s will (by serving in Kenya) yet also searching for God’s will (what would you have us do next). We believe God’s “will of decree” is already done and being accomplished simultaneously (His irresistable grace has freed us and God’s ultimate purposes will be accomplished). God’s ‘will of desire’ we sense in an obedience to serve the under-served. 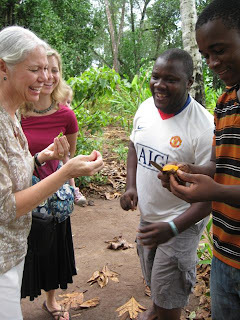 Right now there are an abundance of choices that can be challenging (so many sending agencies, where to serve, how to raise support, teaching hospitals, unreached areas, long-term, part-term, short-term, extending our term, volunteer-term, pursuing further medical education, collaborations with academic centers, or simply pausing for a moment) to navigate all the options. Lastly, there is comfort knowing we proceed without fear that God’s will is not a bulls-eye that we may have struck or missed. He can work in our life in different places, times, situations, careers, and through different people as long as we are committed to living a life that is sanctified (different, set apart for Him). Put on your old college cap and go back to your senior year. Do you remember the question you were asked as graduation approached (whether it was dreaded or eagerly anticipated)....so what are you going to do next. As we advance into the latter third of our 2-year our post-residency program, understandably we get the same question....so Friess Family, what are you going to do next? Believe me I want to know the answer even more than the person asking. It’s a serious question that deserves a prayerful, discerning response. I’ll tell you what the easy answer is...whatever God wills for us. Which is Christianese for, “we really don’t know right now, but whatever it is, it can’t be argued with because it comes from God.” But it begs perhaps the most popular and valuable question almost any person faith has ever asked; God what is your will for me? God where should I go to college? God should I take the job that pays the most? God should I marry him? God should I move across the country for this opportunity? God should I be spending so much time in this hobby? God is this the right church for our family? God do I stick with it, or pack it up and find something new? God when do I start a family? God right now what is the best way to discipline my child? God am I right to hold my own or should I be apologizing? God is it the right time to get back into real estate or the stock market? God when do I retire and what do I do with my life? Wouldn’t an all-knowing and all-loving God be 1) able to know what is the best path for your future and 2)and also want to tell you as His love requires that your best interests are close to His heart? So how come almost any Christian at times in their life feels lost when it comes to knowing God’s will? Sara has put together some pictures and music of what is happening with our family in Kenya. With recently better internet service we have finally been able to link it to our blog in a functional form. I think you will enjoy it! The easiest way to view this 7 minute video is to double click on the video screen to the right (not the red play button) and you will automatically be linked to the you tube clip. Let us know if it works! I haven't posted any "baby" pictures for a while. But this baby deserves mentioning because he is the twin that survived severe pre-eclampsia, death of the other twin at 30 weeks, and born to a mom who had already delivered 3 still-births. 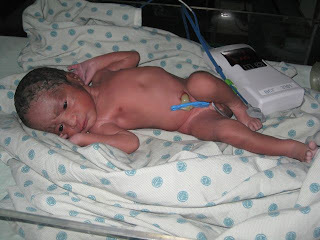 He was born via C-section because of pre-term breech presentation and the first thing he did was scream. There is perhaps nothing more frustrating than being portrayed as you are not. 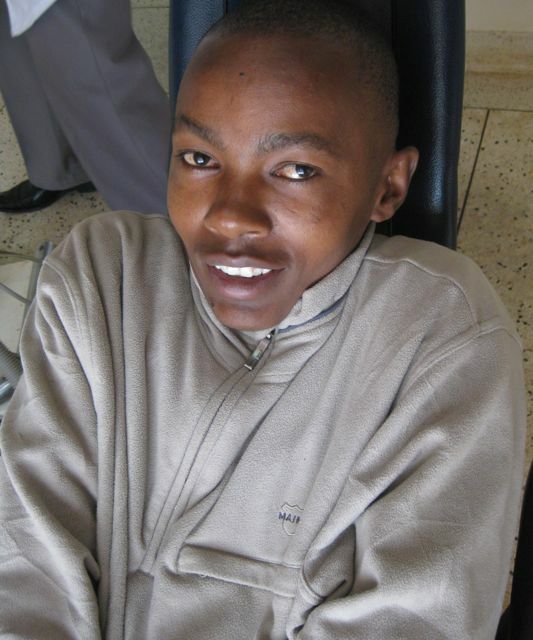 Tenwek (We Treat, Jesus Heals) and Kijabe (Health Care for God's Glory) are forthcoming in their Christian underpinnings. But I was shocked, angry, and saddened to find out what others assumed about how a Christian Mission hospital actually functions. "When the work was done, many of them would smile, grab my arm, and say, "God bless you." People often asked if we are affiliated with any denomination. Our answer is, "No, we will work on you for free even in if you don't believe in Jesus." ....Our work does not trade (healthcare) for a commitment to attend revival indoctrination services. It is not necessarily to manipulate or reflect a dogma, but rather we demonstrate our love for human beings, by helping when needed. We do not pretend our culture is superior." Please let me correct these misconceptions. And if you still have doubts you are welcome to visit. 1) We treat all patient regardless of race, religion, culture, citizenship, or ability to pay. We do not require a patient to have Christian name, carry a Bible, or claim membership to a Christian Church. In fact many of our patients do not believe in or have never heard of Jesus. 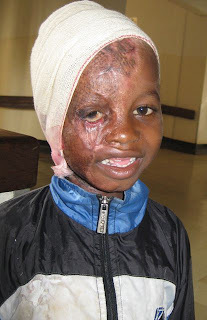 2) Our surgeries, medicine, and care comes with no strings attached. "Revival Indoctrination services" are not required. In fact I don't think I've ever seen a Tent Indoctrination service. We have a chaplaincy service that is available, not mandatory for any patient in need of prayer or counseling. 3) We do not manipulate or coerce our patients into death-bed confession. We do not withhold care or medicine until a decision or conversion occurs. 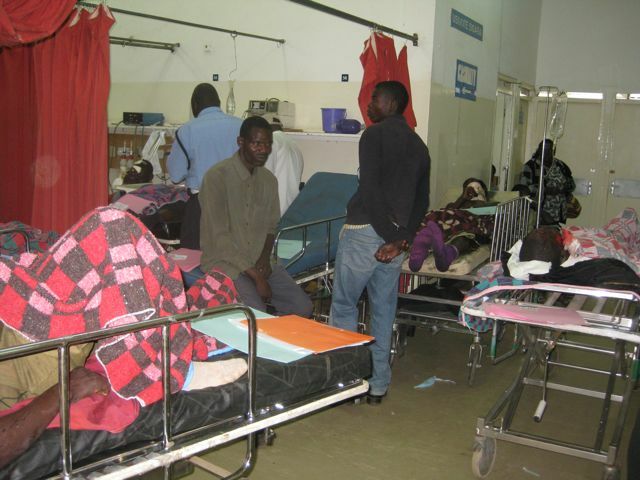 On the contrary we seek to give them a high standard of compassionate healthcare such that patients get better. 4) We as a Christian Mission Hospital have set of beliefs that is anything but dogmatic. We have a sympathetic and humble attitude that you come broken, sick, hurting and in need of compassion, love, and healing. 5) We do not demand that our culture is superior. We respect our Maasai, Kikuyu, Kaligen, Kamba, Somali, Sudanese, Luo, Luya, Wahindi and all other other tribes and nations of patients. We do not try to make you into middle class Americans. I hope these misconceptions about Christian Mission Hospitals are rare and quickly disappearing. And above all I pray these misconceptions are never true. Instead lets us be known as Christ has commanded us. Some of the Kenyan tribes have preserved their traditional dress, culture, and pastoralist lifestyle. They have remained with simple diets relying on staples of rice, potatoes, and milk. They have avoided and also have little taste for western foods like soda, cookies, crackers, and other sweets. 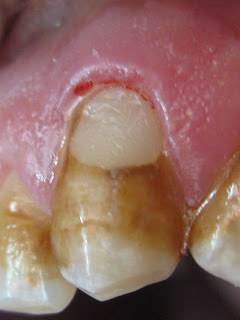 I find from a dental perspective that these patients have aesthetic, naturally white smiles, with little decay or stain. Back in the states home bleaching trays, in-office zoom whitening, and other products like Crest Whitening Strips are becoming very popular to establish a whiter smile. Our composite (tooth colored filling materials) typically come in shades A-D and 1-4. 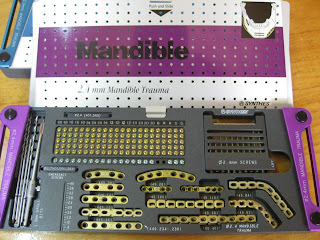 Maybe when you have been at the dentist you have heard the dentist and assistant going back and forth, "I think she's a B-2, no look at the cervical she is really a C-3." Aren't we kind to categorize you by the shade of your teeth? Anyway, because of the whitening products new shades of composites like extra-light, and extra-extra light have been developed to restore anterior whitened teeth to achieve an appropriate shade match. In Kenya we often have the opposite problem. We simply need some darker composite shades. Say a Z-4, as you can see in the restoration to the right (different patient from the full face picture). Many patients are not to blame for their brown teeth (quite honestly some don't care. Of which I can understand as they have bigger fish to fry in their daily life like putting dinner on the table tonight) . The brown intrinsic staining and pitting of teeth is often due to dental fluorosis caused by excessive fluoride in the water here along the Great Rift Valley. In 1990 the census determined that the total number of Americans living abroad is estimated at 3 million. The book ‘Third Culture Kids’ takes a needed look at understanding who they are, determining their profile, and estimating the best ways they can maximize their life. Let me share a few interesting sections of this book that ring true with my experience with Missionary Kids (and Third Culture Adults) in Kenya the past 18 months. 1) They experience high mobility. In the past two years we have lived in 2 different countries, 3 different locations, and 5 different homes/apartments. We have all seen good friends come and go, some to return again some we will not see again. It can make people flexible and quick to initiate friendship on the flip side overly-protected. 2) There is a Painful/Realistic view of life. Poverty, sickness, neediness is ever-present. We hope this instills compassion and identity that we are “One in the Body” and not prejudice, blame, or simply fatigue. 3) There is a sense of Restlessness. Where is home? It can lead to a feeling of physical rootlessness but at the same time preserve the notion that home is not a physical place but an emotional place where you are loved by family. 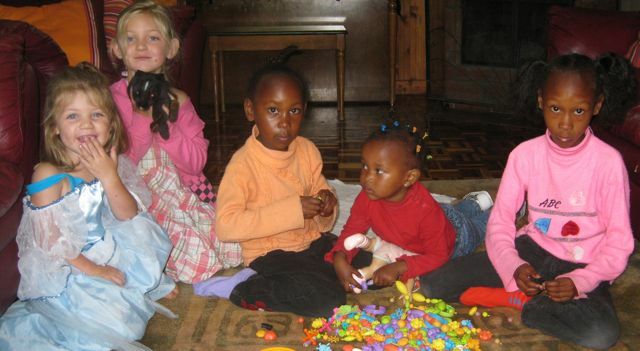 4)TCK’s often develop many friendships because so many people come and go, but it is simply hard to maintain them all. a) Superficial- Small talk. How are you? Where are you from? How is the weather? b) Still Safe- Exchanging no Risk Facts. Where did you go on Vacation? c) Judgmental Level- We being to risk a few questions sharing opinions on religion, politics, child-rearing. d) Emotional Level- Sharing how they feel about life. I’m happy, depressed, anxious, homesick, encouraged. e) Disclosure Level- Revealing private ideas and difficult failures. Involves and honesty and vulnerability that leads to intimacy. Most only have a few if not just one person who fits in the 'Disclosure' level of friendship. Some have no-one like this in which to share. TCK’s and TCA’s move quickly through levels a and b to reach c. Why? It may be a sense of urgency due to high mobility of friendships. It also may be cultural. Europeans are quick to launch into talks of politics which may be divisive. Americans look for common ground in sports, TV, movies. 5) TCK’s are quite comfortable talking to adults because they spend a lot of time with them. They can seem overly-mature for their age. 6) There is frequently unresolved grief due to the stresses of normal life in a developing world (death, isolation, anxiety). In these situations comfort is often confused with encouragement. Comfort says I can’t change things. Comfort puts and arm around a shoulder and just says I’m sorry. Comfort validates grief. Comfort gives grief permission. It recognizes that this grief is normal, understood, and that the griever is not alone. Encouragement presumes this situation will turn around. Encouragement tends to bypass grief, often unintentionally delegitimizing the grieving process. 7) Both spouses must favor the move to a third culture for it to work. 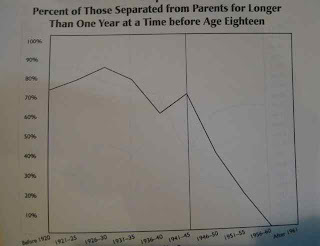 8) Kids need to be feel that the work there parents are doing is important. First they just need to know what Mom and Dad are doing at the hospital. 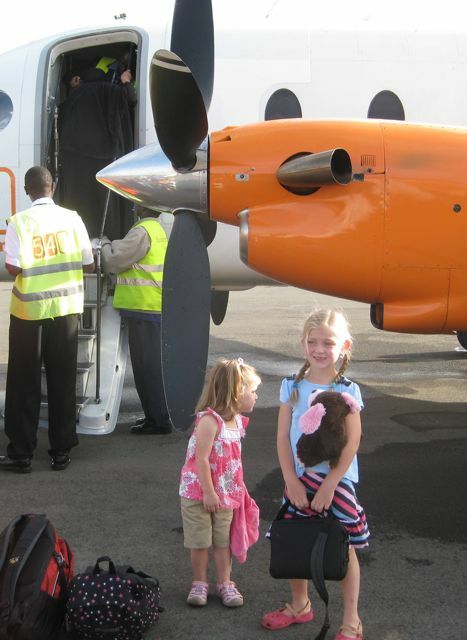 Second, they need to know that at this time God has called not just Mom and Dad but our whole family to serve in Kenya. If there is no sense of calling, need, or justification for being here for the children, they may feel they have been absconded to a foreign country with no real reason. 9) Establishing a physical home in your home country is recommended. 10) Build strong ties with relatives and friends. 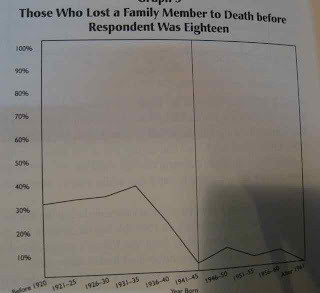 Lastly, you may find a few graphs taken from the book interesting. 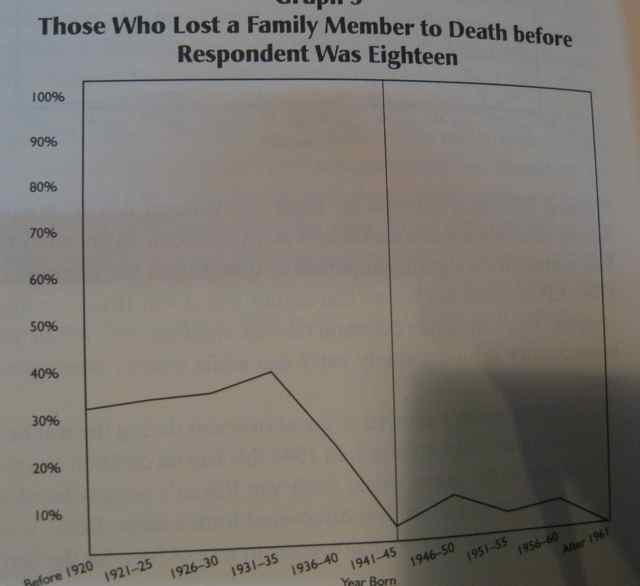 Safety of missionaries (thankfully) has vastly improved. A tendency towards TCK's who are in boarding school towards higher frequency visits at home with parents. The trend is tending away from early boarding school. 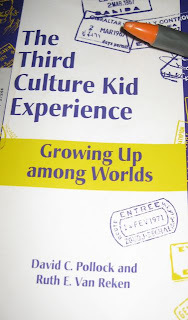 The authors in my opinion decidedly refrained from offering a tight summary or study of how TCK’s function as adults. Making an assertion would oversimplify the complexity of growing up as a TCK and its affect on the rest of their life. 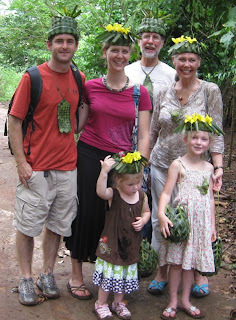 It seems that each TCK has a distinct experience and would speak for themselves regarding how growing up in a Third Culture has affected their development. 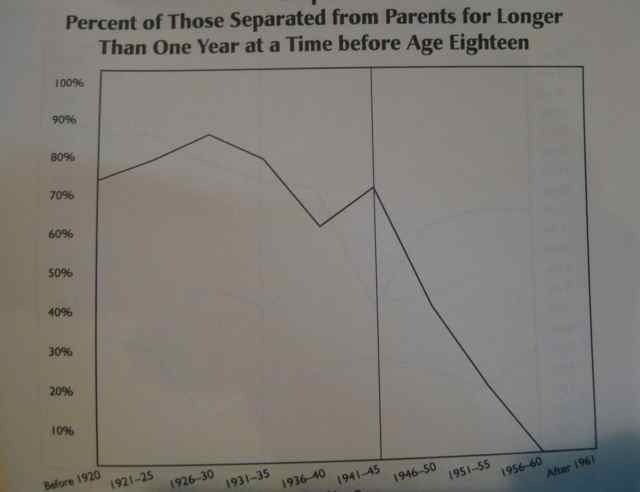 I think parents occasionally pause to reflect about how the life they have chosen or feel called to live (working vs. stay-at-home, urban vs. rural, public school vs. private) is affecting their children. 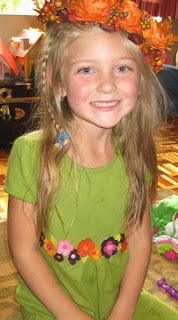 Coming this Fall Amelia will have spent nearly one-third of her life and Meredith over one-half of her life in Kenya. How is this affecting them? What are the benefits and challenges? How to they see their Passport Country and their Host Culture? How will they deal with past and upcoming transitions? How do they answer the seemingly simple question; Where are you from? (Northwest US, Akron, Kijabe, Tenwek?) 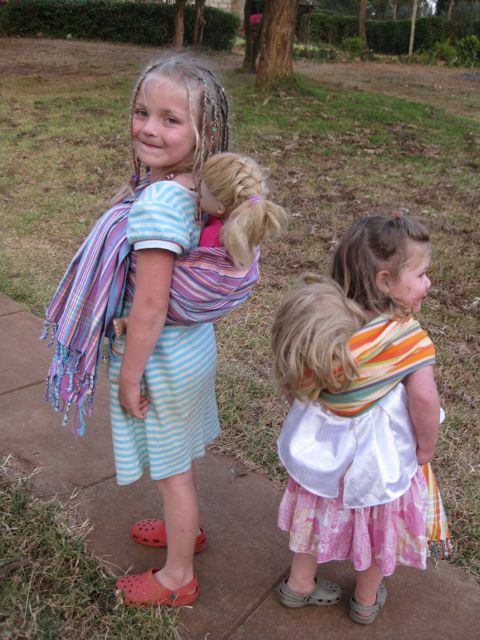 Maybe I am way over-thinking how a couple years in Africa and possibly longer might affect my 6 and 3 year-old daughters. 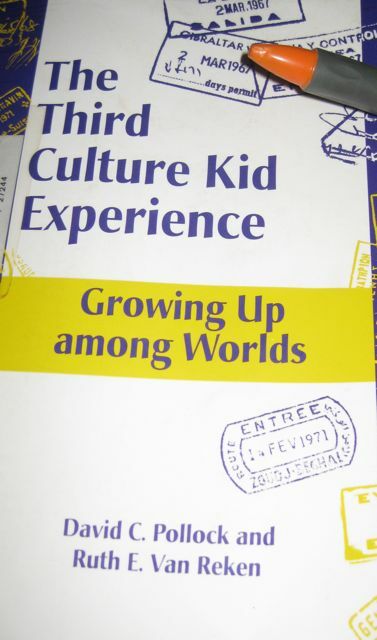 It was a due to a recommendation of a book by authors Pollock and Van Recken in which I found that Amelia and Meredith have a name; they are called Third Culture Kids (TCK). Third Culture Kids are defined as, "a children who have spent a significant part (more than a few weeks) of their developing years (between ages 0-18) outside their parents' culture. TCK’s build relationships to all of the cultures, while not having full ownership in any (they can belong everywhere and nowhere at the same time)." Maybe you are a TCK as well. You may ask why it is referred to as a THIRD culture? Amelia and Meredith are growing up in Kenya. Isn't that just a second culture? Not exactly. America is their first culture. Kenya would be their second culture. The Kijabe Mission Compound including their school at RVA would be considered their “Third Culture.” Kijabe certainly isn’t America, but it’s not typical Kenya either. Like a child who grows up on a foreign military base, business enclave, or for Amelia and Meredith a missionary compound, each place has its own distinct style, vocabulary, and pattern of life that is different from their home or host culture. Meredith said she had two itches and was proud to show me her medical care. Sara is on call this weekend until Monday morning. We as a family stay near the hospital and Sara carries her pager wherever she goes and sleeps much lighter. Call seems to be one of the most controversial (let's count the call schedule for the month including holidays), tiresome (I'll be working the next day too), and challenging (where is the needed surgical staff and residents at night) parts of being a physician. I make jokes as a dentist that I take call 24/7 in case of an avulsed tooth, dislocated jaw, dental cellulitis. It can be demanding, but I bear this burden and they have yet to give me a pager at Kijabe....but I don't get as much as a smile from my physician colleagues. Sara's call can vary from just a few phone calls regarding patient management that she can coordinate from home to being up all night in Theatre doing c-sections, treating patients with bleeding, shock, seizure, coding, etc. 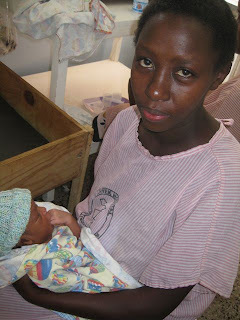 One of Sara's least favorite parts of Call is the dark walk past the cemetery, around the open field of trees, around the pediatric tent, into the main gain with sleeping guards (knock, knock, to wake them up), through the noisy gale force winds of the Kijabe night to the Maternity Ward. 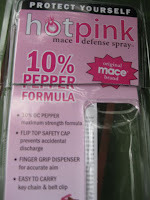 Sara's good friend brought back Mace. This is no ordinary Mace. It comes with 10% Pepper Spray (maximum strength) and Finger Grip Dispenser for maximum accuracy. 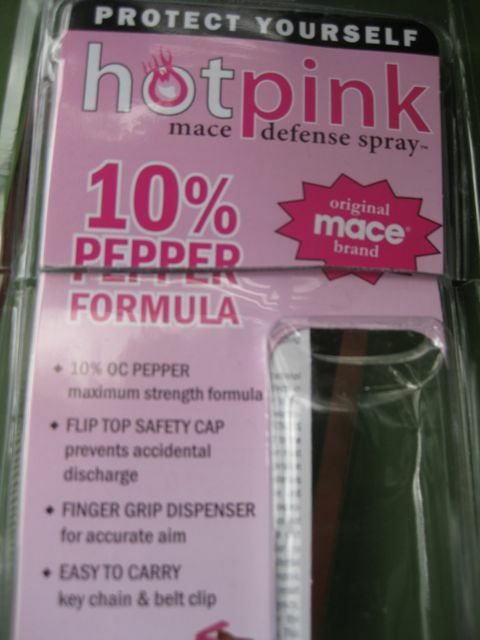 We hope Sara never has to discharge her weapon, but beware this deterrent is Hot Pink! 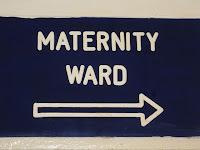 I saw a patient who was now 28 weeks pregnant. 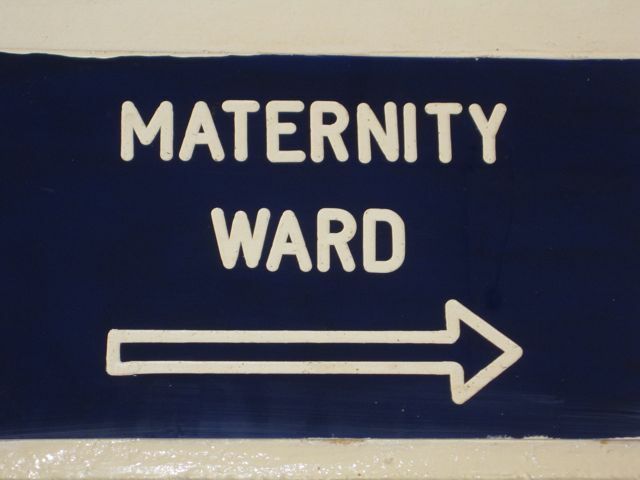 What made this so significant is that she has lost 9 pregnancies between 10-20 weeks. About 4 months ago I put a cerclage (a stitch to keep the cervix closed) and started her on progesterone. There she was hoping for a good outcome this time, praying for a live baby to hold. Then I saw a woman 32 weeks pregnant with twins (one having died in utero at 28 weeks) who had previously had 3 stillbirths from hypertension. Her pressure was high today, so she's admitted, getting steroids for lung maturity and will likely be delivered this weekend when I'm on-call. Sometimes the stories I hear I don't want to even believe because it seems so cruel the suffering these women have faced. Yet I know God is love and that God loves these women. And so, I cling to that. 10 things Amelia has learned while living in Kenya. 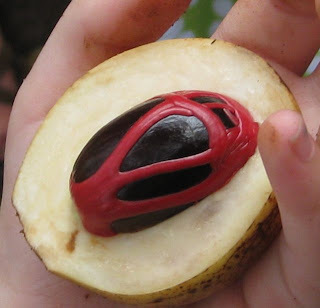 1) I can make glasses from leaves and lipstick from a spice. 2) I can read to chapter 4 in a Junie B. Jones book. 4) I am learning to sew a quilt on the sewing machine. 5) I can count to 10 and play Simon says in Swahilli. 6) Pesto Pasta is my new favorite food. 7) Reading my Kid's Bible in church does make the sermon go by faster. 8) My 3 year old sister Meredith wakes up early and always talks a lot. 9) I sometimes get carsick here because the roads are so bumpy. 10) I didn't really want to go to school at first, but I never knew first grade could be this much fun. Kijabe is fortunate to have a pathology lab here at the hospital that serves Kijabe as well as at least 20 other mission hospitals all over Africa. Samaritan's Purse/World Medical Mission keep a cycling group of retired and semi-retired pathologists staffing the path lab here from month to month. 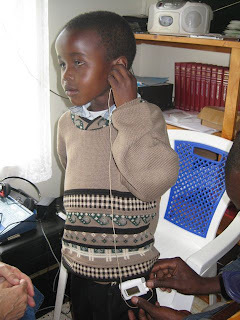 Furthermore Kijabe pathology has the capability to capture pictures from their microscopes and digitally send them to a pathology specialist when needed. 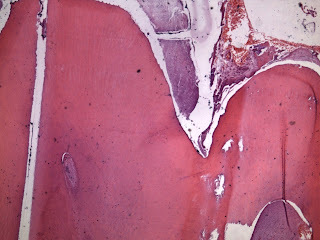 A recent pathologist (Dr. Gray) took a particular interest in my patient. 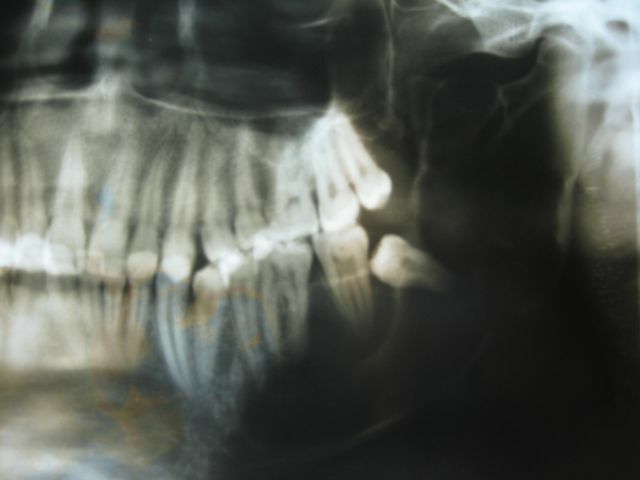 Patient was diagnosed clinically and radiographically with complex odontoma and lack of eruption. Complex odontoma is tumor characterized by the formation of calcified enamel and dentin in an abnormal arrangement because of lack of morphodifferentiation. Often times they look like a miniature ball of malformed teeth. 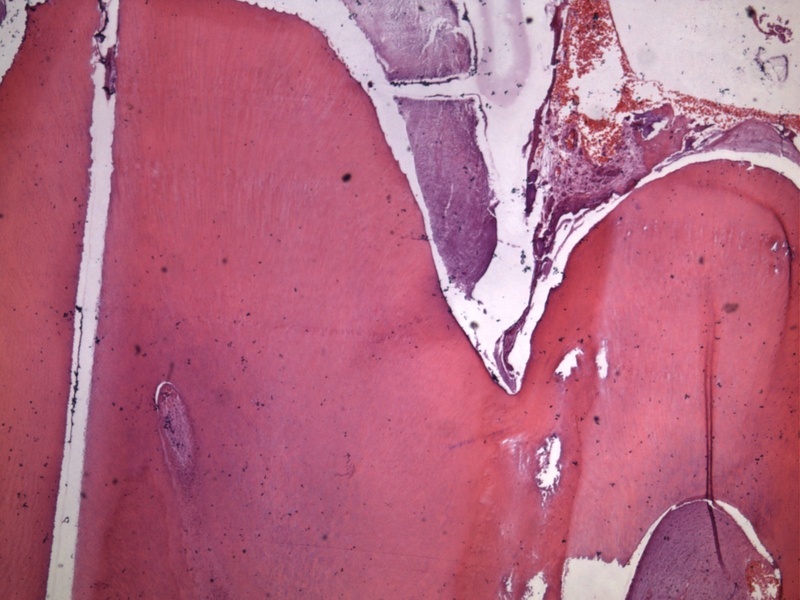 Dr. Gray was kind enough to e-mail me the microscopic viewpoint of the complex odontoma (I'll never quite know how they section this hard tissue thin enough to see under a microscope). 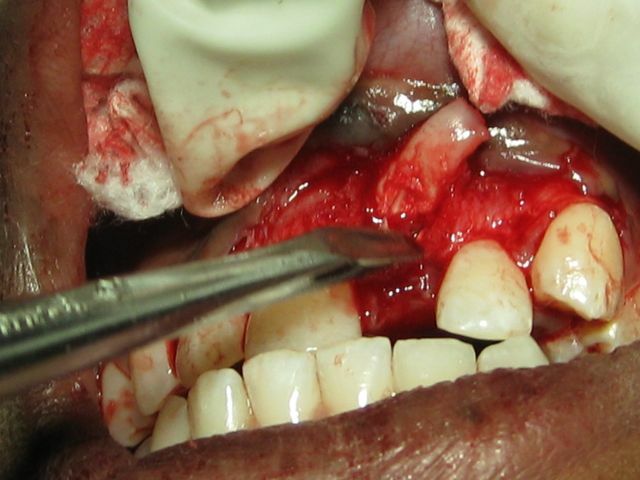 If I remember my oral histology correctly I think the pink is dentin tubules and darker purple the pulp complex. What's that on the window sill? At least 6 of these had been sitting in the window sill of the dental clinic for the last 4 weeks. They were always directed toward the window, "basking in the sun" as they might say in Kenya. What was this little device with the name Comcare. After some snooping around, I soon found out from the ENT's wife (dental and ENT share a building) that this device basking in the sun is a solar powered hearing aid designed specifically for the third world. They are made by Comcare (http://www.comcareinternational.org/) About 15 were brought over from the States via a donation from Kiwanis (each hearing aid costs just over 100 USD). With just a couple hours of sunlight this device can provide hearing for a child throughout an entire day. Solar-power, of course makes sense as the sun is nearly always shining in Africa, and batteries are too expensive. 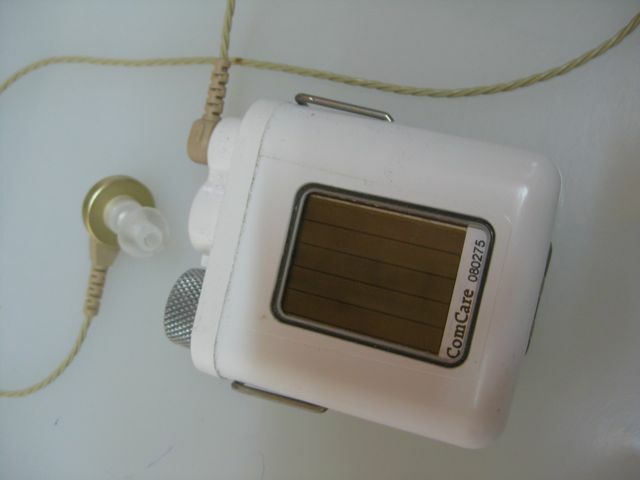 Imagine watching a child put the I-POD like ear phone into their ear and see the smile on his face as he hears his voice for the first time. Why again do we celebrate Easter? Last week I asked Amelia why we celebrate Easter, "I think Daddy, it's Jesus' Birthday," she said. Dooohhh! I know we have been through this before and explained Jesus' death on the cross, the empty tomb, the stone that had been rolled away, and that Jesus is alive. Why had Amelia forgotten? 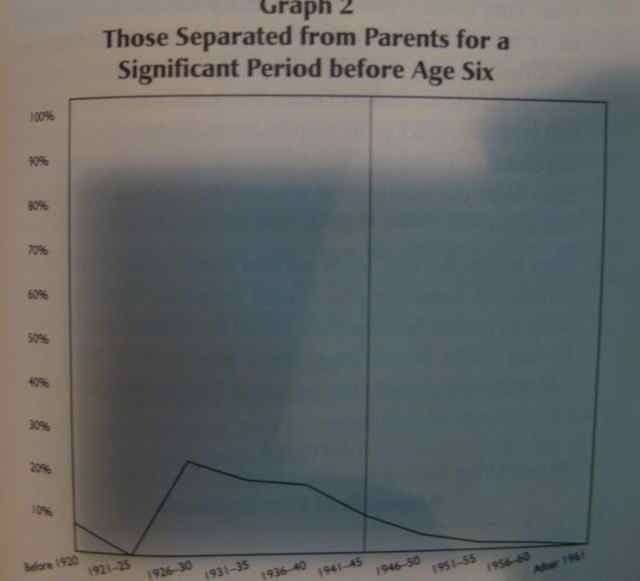 What were we doing wrong as parents? 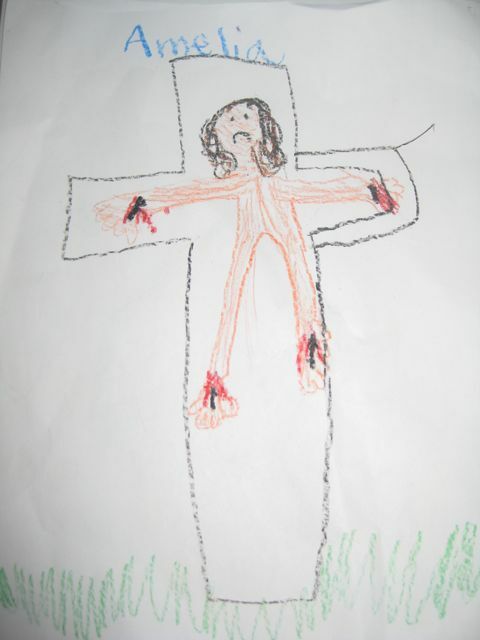 But Amelia's theology must have come back to her this morning at AIC church Sunday School in the picture she drew (she was proud to tell us her picture had the nails and blood) for us. But I think I often forget the reason we celebrate easter just as easily as Amelia does. Why did the Son of God take this path towards redeeming his creation? And what did the crucifixion, resurrection, and ascension settle? Romans 3:25 – whom God put forward as a propitiation by his blood, to be received by faith. This was to show God’s righteousness, because in his divine forbearance he had passed over former sins. Isaiah 53:10 – Yet it was the will of the Lord to crush him; he has put him to grief; when his soul makes an offering for guilt, he shall see his offspring; he shall prolong his days;the will of the Lord shall prosper in his hand. Hebrews 5:8 – Although he was a son, he learned obedience through what he suffered. Hebrews 2:10 – For it was fitting that he, for whom and by whom all things exist, in bringing many sons to glory, should make the founder of their salvation perfect through suffering. Hebrews 13:20-21 - Now may the God of peace who brought again from the dead our Lord Jesus, the great shepherd of the sheep, by the blood of the eternal covenant, (21) equip you with everything good that you may do his will, working in us that which is pleasing in his sight, through Jesus Christ, to whom be glory forever and ever. Amen. Romans 5:7-8 – For one will scarcely die for a righteous person — though perhaps for a good person one would dare even to die — (8) but God shows his love for us in that while we were still sinners, Christ died for us. John 3:16 – “For God so loved the world, that he gave his only Son, that whoever believes in him should not perish but have eternal life. Romans 5:9 – Since, therefore, we have now been justified by his blood, much more shall we be saved by him from the wrath of God. Romans 3:28 – For we hold that one is justified by faith apart from works of the law. Philippians 2:8 – And being found in human form, he humbled himself by becoming obedient to the point of death, even death on a cross. Romans 5:19 – For as by the one man’s disobedience the many were made sinners, so by the one man’s obedience the many will be made righteous. Romans 8:34 – Who is to condemn? Christ Jesus is the one who died — more than that, who was raised — who is at the right hand of God, who indeed is interceding for us. Galatians 5:11 – But if I, brothers, still preach circumcision, why am I still being persecuted? In that case the offense of the cross has been removed. Galatians 6:12 – It is those who want to make a good showing in the flesh who would force you to be circumcised, and only in order that they may not be persecuted for the cross of Christ. Mark 14:24 – And he said to them, “This is my h blood of the covenant, which is poured out for many. Jeremiah 32:40 – I will make with them an everlasting covenant, that I will not turn away from doing good to them. And I will put the fear of me in their hearts, that they may not turn from me. 1 Corinthians 5:7 – Cleanse out the old leaven that you may be a new lump, as you really are unleavened. For Christ, our Passover lamb, has been sacrificed. Hebrews 9:14 – how much more will the blood of Christ, who through the eternal Spirit offered himself without blemish to God, purify our conscience from dead works to serve the living God. Isaiah 53:5 – But he was wounded for our transgressions; he was crushed for our iniquities; upon him was the chastisement that brought us peace, and with his stripes we are healed. Romans 5:10 – For if while we were enemies we were reconciled to God by the death of his Son, much more, now that we are reconciled, shall we be saved by his life. 1 Corinthians 6:19-20 – Or do you not know that your body is a temple of the Holy Spirit within you, whom you have from God? You are not your own, (20) for you were bought with a price. So glorify God in your body. Acts 20:28 – Pay careful attention to yourselves and to all the flock, in which the Holy Spirit has made you overseers, to care for the church of God, which he obtained with his own blood. Hebrews 7:23-27 – The former priests were many in number, because they were prevented by death from continuing in office, (24) but he holds his priesthood permanently, because he continues forever. (25) Consequently, he is able to save to the uttermost those who draw near to God through him, since he always lives m to make intercession for them. (26) For it was indeed fitting that we should have such a high priest, holy, innocent, unstained, separated from sinners, and exalted above the heavens. (27) He has no need, like those high priests, to offer sacrifices daily, first for his own sins and then for those of the people, since he did this once for all when he offered up himself. Hebrews 9:24-26 – For Christ has entered, not into holy places made with hands, which are copies of the true things, but into heaven itself, now to appear in the presence of God on our behalf. (25) Nor was it to offer himself repeatedly, as the high priest enters the holy places every year with blood not his own, (26) for then he would have had to suffer repeatedly since the foundation of the world. But as it is, he has appeared once for all at the end of the ages to put away sin by the sacrifice of himself. Hebrews 4:15-16 – For we do not have a high priest who is unable to sympathize with our weaknesses, but one who in every respect has been tempted as we are, yet without sin. (16) Let us then with confidence draw near to the throne of grace, that we may receive mercy and find grace to help in time of need. 1 Peter 1:18-19 – knowing that you were ransomed from the futile ways inherited from your forefathers, not with perishable things such as silver or gold, (19) but with the precious blood of Christ, like that of a lamb without blemish or spot. Revelation 1:5-6 – and from Jesus Christ the faithful witness, the firstborn of the dead, and the ruler of kings on earth. To him who loves us and has freed us from our sins by his blood (6) and made us a kingdom, priests to his God and Father, to him be glory and dominion forever and ever. Amen. Hebrews 13:12 – So Jesus also suffered outside the gate in order to sanctify the people through his own blood. 2 Corinthians 5:15 – and he died for all, that those who live might no longer live for themselves but for him who for their sake died and was raised. Galatians 6:14 – But far be it from me to boast except in the cross of our Lord Jesus Christ, by which the world has been crucified to me, and I to the world. 1 Peter 2:19-21 – For this is a gracious thing, when, mindful of God, one endures sorrows while suffering unjustly. (20) For what credit is it if, when you sin and are beaten for it, you endure? But if when you do good and suffer for it you endure, this is a gracious thing in the sight of God. (21) For to this you have been called, because Christ also suffered for you, a leaving you an example, so that you might follow in his steps. Hebrews 12:3-4 – Consider him who endured from sinners such hostility against himself, so that you may not grow weary or fainthearted. (4) In your struggle against sin you have not yet resisted to the point of shedding your blood. Philippians 2:5-8 – Have this mind among yourselves, which is yours in Christ Jesus, (6) who, though he was in the form of God, did not count equality with God a thing to be grasped, (7) but made himself nothing, taking the form of a servant, being born in the likeness of men. (8) And being found in human form, he humbled himself by becoming obedient to the point of death, even death on a cross. Luke 9:23 – And he said to all, “If anyone would come after me, let him deny himself and take up his cross daily and follow me.Matthew 10:38 – And whoever does not take his cross and follow me is not worthy of me. Hebrews 2:14-15 – Since therefore the children share in flesh and blood, he himself likewise partook of the same things, that through death he might destroy the one who has the power of death, that is, the devil, (15) and deliver all those who through fear of death were subject to lifelong slavery. 1 Thessalonians 5:10 - who died for us so that whether we are awake or asleep we might live with him. Philippians 1:21, 23 – For to me to live is Christ, and to die is gain… I am hard pressed between the two. My desire is to depart and be with Christ, for that is far better. 2 Corinthians 5:8 – Yes, we are of good courage, and we would rather be away from the body and at home with the Lord. Romans 6:5 – For if we have been united with him in a death like his, we shall certainly be united with him in a resurrection like his. Colossians 2:14-15 – by canceling the record of debt that stood against us with its legal demands. This he set aside, nailing it to the cross. (15) He disarmed the rulers and authorities and put them to open shame, by triumphing over them in him. 1 John 3:8 - Whoever makes a practice of sinning is of the devil, for the devil has been sinning from the beginning. The reason the Son of God appeared was to destroy the works of the devil. Ephesians 2:14-16 – For he himself is our peace, who has made us both one and has broken down in his flesh the dividing wall of hostility (15) by abolishing the law of commandments expressed in ordinances, that he might create in himself one new man in place of the two, so making peace, (16) and might reconcile us both to God in one body through the cross, thereby killing the hostility. John 11:51-52 – He did not say this of his own accord, but being high priest that year he prophesied that Jesus would die for the nation, (52) and not for the nation only, but also to gather into one the children of God who are scattered abroad. John 10:16 - And I have other sheep that are not of this fold. I must bring them also, and they will listen to my voice. So there will be one flock, one shepherd. Hebrews 9:28 – so Christ, having been offered once to bear the sins of many, will appear a second time, not to deal with sin but to save those who are eagerly waiting for him. Hebrews 12:2 – looking to Jesus, the founder and perfecter of our faith, who for the joy that was set before him endured the cross, despising the shame, and is seated at the right hand of the throne of God. Hebrews 2:9 - But we see him who for a little while was made lower than the angels, namely Jesus, crowned with glory and honor because of the suffering of death, so that by the grace of God he might taste death for everyone. Acts 4:27-28 – for truly in this city there were gathered together against your holy servant Jesus, whom you anointed, both Herod and Pontius Pilate, along with the Gentiles and the peoples of Israel, (28) to do whatever your hand and your plan had predestined to take place. As we approach the most important day in the Christian Calendar; Easter Sunday I was reminded by Amelia in her recent recitation of Psalm 100 that on Easter we can shout for joy, worship with gladness, approach Him in song, have confidence that God is God, declare our Thankfulness, and above all celebrate that He has conquered death such that His love and His faithfulness will continue forever. Jumping on the 540 plane on our way to the island of Zanzibar (just off the coast of Tanzania) with a not very direct route through Dar Es Salam and Mt. Kilimanjaro airports. A nice view of the Mt. Kilimanjaro (highest peak in Africa at 19,340 feet). I was standing at the summit of Kilimanjaro a little over a year ago in pitch black and I was very very cold! A needed nap is a sign of a great vacation for kids or adults! Thanks Nana and Papa (Mom & Dad) for great time with you on Spice Island! As Meredith would say, "we will miss Nana and Papa when they are gone!"